When I filled out the interest form for the Celestial Almanack by Jay Ryan, I was very excited. And in my comments, I talked about how the product sounded so incredibly perfect for me, and that I'd have no problem using it in a very short time period and writing up a review... because I live in Colorado. You know, where we have 300+ days of sun annually. I shouldn't have bragged on our beautiful clear skies. 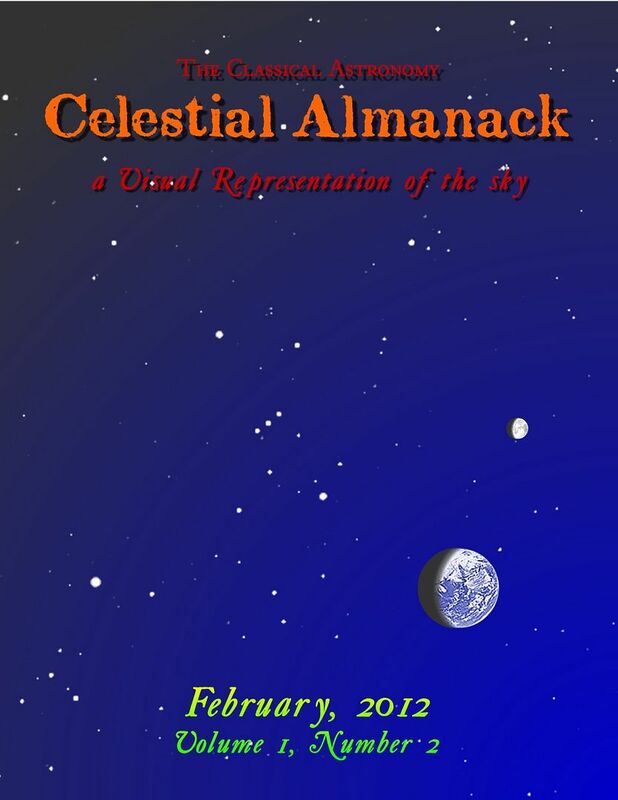 Since receiving the February Celestial Almanack, I haven't even been able to see the moon at night, much less any stars. So this review is going in a totally different direction than I expected. Because I really can't tell you if Jay does a good job of helping you to actually find the stuff he tells you to go out and look for. Though... I assume he does, as his Facebook page will often have comments about some of the neat stuff in the sky, and we have always been able to see whatever he's talked about there. So this Almanack is being used -- so far -- basically as a read-aloud. And all of my boys (ages 7-14) are completely enthralled. Trina (nearly 6) thinks it is pretty boring. However, she has loved going out and finding Jupiter (the most recent Jay Ryan-inspired sky-watching we have done), so I think she will enjoy that aspect of the Almanack when we do get to see stars again. There is simply so much information packed into this little pdf file. And a lot of it is stuff I never knew... like the discussion of leap year and how it came about. Okay, I thought I knew everything I needed to know... but one thing I guarantee I had never ever read or heard has to do with the original leap day being added after what is our February 24. Seeing as that is my birthday, that little tidbit of info would have stuck with me. In addition to great discussion of how the calendar came about, there is information on the declination of the sun (no, I didn't know what that meant either, not until I read it to my kids! ), Orion, the north, east and west horizons, and great stuff about the planets (Jupiter, Venus, Mars and Saturn) and what they are up to (in general, and this month in particular). All of the above is written with such a wonderful, conversational tone. It doesn't intimidate me, and while a bit of the subject matter flies over the heads of my youngest two, even they are understanding a lot of it... and the teens and tween are grasping it well. One thing I love is that the discussion of the various constellations includes a "star" rating -- with most of the suggestions being a one-star activity (very easy) or a two-star activity (like finding the Big Dipper)... but there are a few 3- and 4-star activities too. He mentions his high school astronomy materials, Signs and Seasons, a couple of times, but it is definitely NOT necessary to have that in order to make use of the Almanack. Disclaimer: As part of the TOS Homeschool Review Crew, I did receive this publication for the purpose of a review. All opinions are my own. For more about my take on reviews, visit my blog post here.